Quick update on the YTO/YTF driver board – with 16 bits of resolution. Assembly, is complete, and basic function has been checked – digital control test will follow tomorrow. Current is settable from 0 to 250 mA, with 65535 counts of resolution – about 3.8 Microamps per LSB. All has been build to minimize noise, with heavy filtering on the supplies. The DAC is run from a dedicated 5 V supply, with a 2.5 V precision reference, 1 ppm/K, MAX6325ESA+. 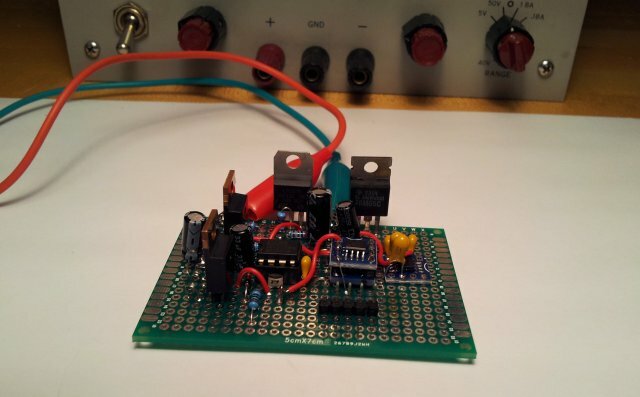 The U to I converter is powered by 11.4 V – provided by a LM317 voltage regulator. Switching element is an IRF730, operated as a series variable resistance in series with the coil. Looking at the BoM, the parts sum up to about USD 35 plus board, not bad – target is to stay below about $100 for the final assembled unit, which will be achievable, no issue. Main cost comes from the MAX reference, and the DACs (DAC8830), almost USD 22. 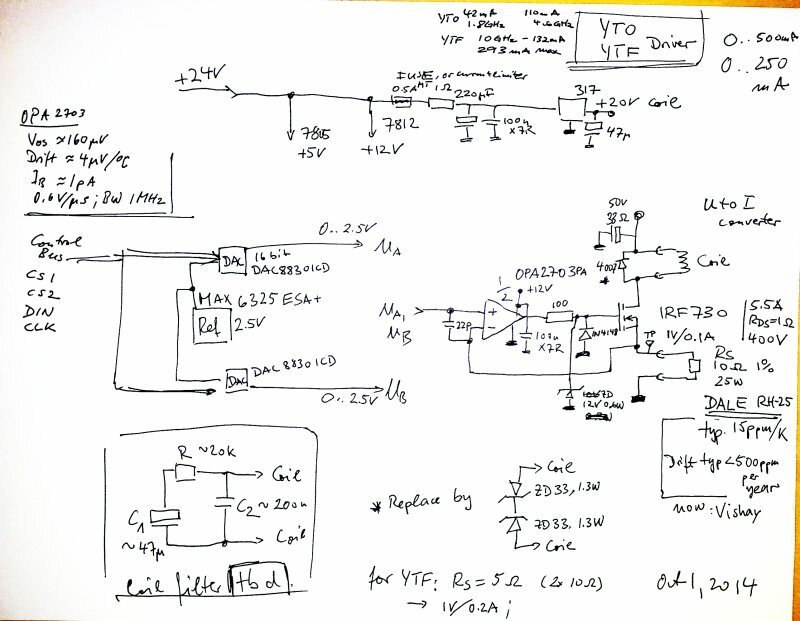 For a digitally controlled YIG oscillator and filter, a driver is needed that can convert serial data from a microcontroller to a well defined, stable, and low noise current. Bandwidth of the circuit should be a few 100 Hz, and maximum current in the 300 mA range, so it needs to run of a reasonably high supply voltage, otherwise, the inductance of the coil will limit the slew rate. The YTO needs about 120 mA full scale, the YTF about 260 mA. I might do some fine tuning on the DACs later or change the current sense resistors for a 2.5 V drop at close to max current, for best signal to noise ratio, but for the test circuit, 10 Ohm RH-25 resistors will be used. The current sense resistors are a very critical part – they need to be low drift, over time, and over temperature, regular resistors, with 100 ppm/K or more will only cause drifting frequencies, and trouble. That’s the test setup, with +20 V and -10 V power supply, for the YIG. In the final setup, there will be independent, filtered and regulated supplies for low phase noise. YTO is a HP 5086-7259, 2.0-4.5 GHz (nominal). So, about +-40 MHz – close to expected +-35 MHz. 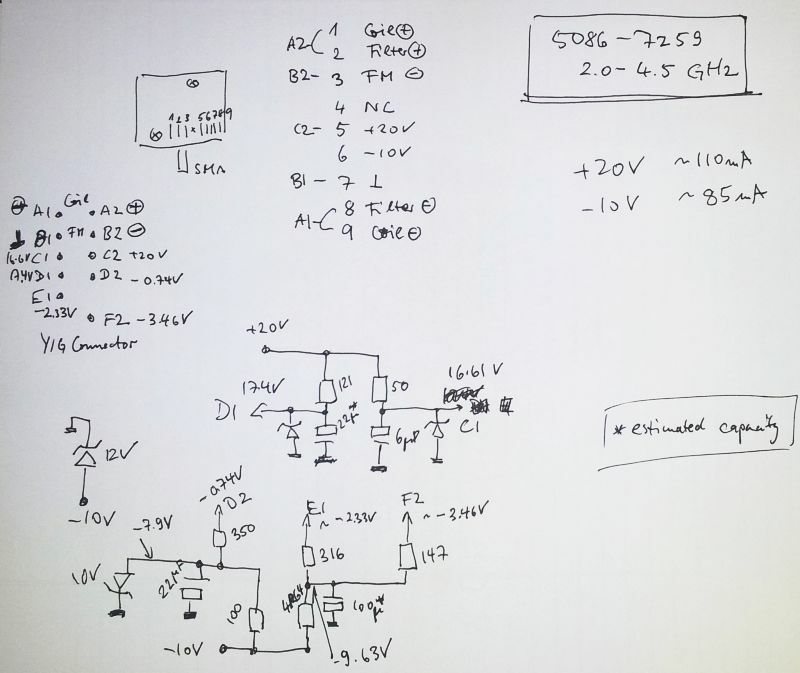 Here a quick calculation of the DAC resolution, 1 LSB will be about 0.13 MHz, more than sufficient for the DAC tune. The DAC used, a DAC8830ICD has typical +-0.5 LSB non-linearity, max +-1 LSB. Additional tuning will be easily accomplished by the FM coil, using a PLL. For a project involving an harmonic mixer, a strong and quiet – low phase noise – local oscillator is required. 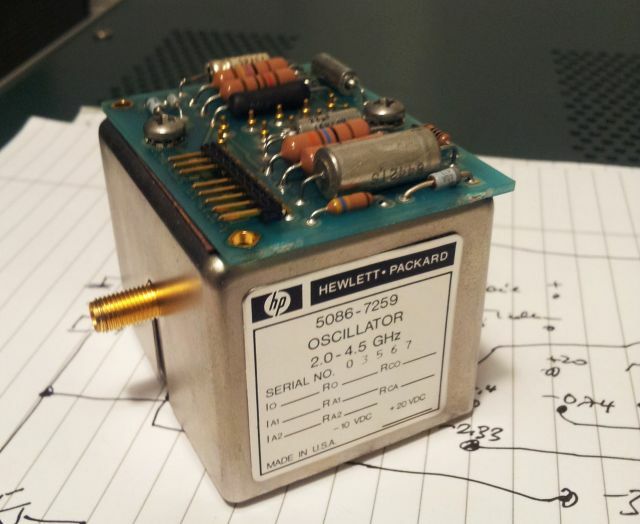 Looking around, I found a 5086-7259 in one of my boxes, a popular part, used in some high-quality HP test equipment. Unfortunately, no data around, and this might also be the reason why these often go for about 50 USD on xbay. 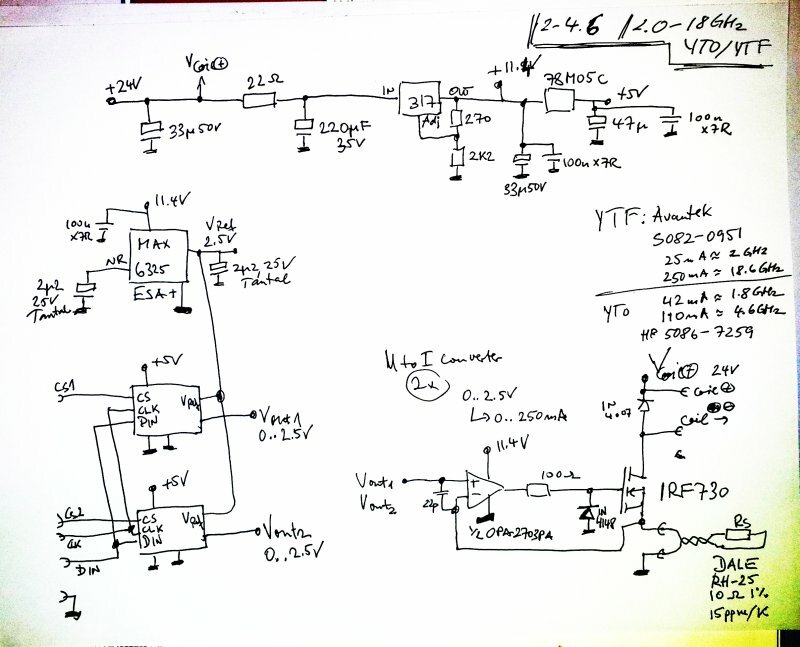 After some study of the circuit, here a rough schematic. It is essentially a set of Zener diodes and filter caps, plus some high-quality resistors. The thing needs a +20 Volt, and -10 Volt supply. Not a problem – typically, this would be provided by dedicated low noise regulators, from the 24/28 V and -15 V rails common in test equipment. Some measurement of the tuning current – it needs about 42 mA at 1.8 GHz (seems to work below the specified 2 GHz), and about 110 mA at 4.6 GHz – therefore, sensitivity as about 43 MHz per 1 mA. 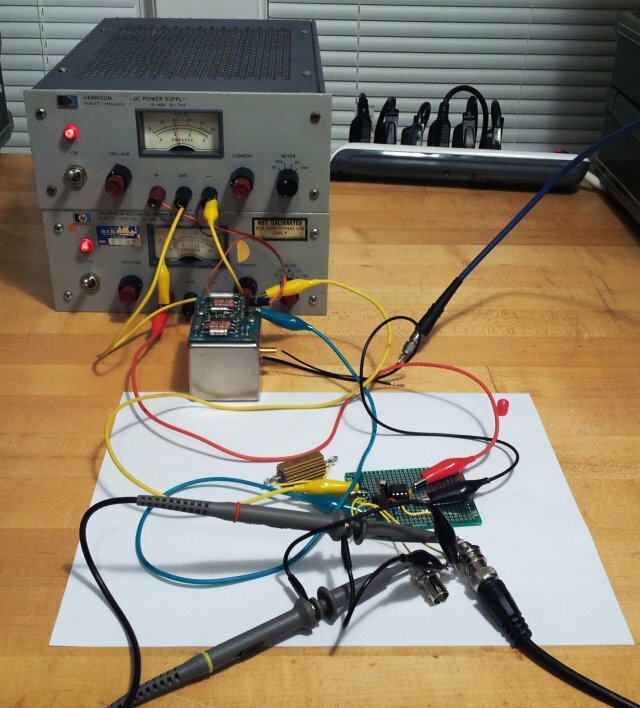 Doing a quick calculation – setting the frequency to 1 MHz will required a DAC of about 12.5 bits resolution. Using a 16 bit DAC for the coarse tune current will be perfect, about 70 kHz per LSB; with phase lock on the FM coil. SimonsDialogs – A wild collection of random thoughts, observations and learnings. Presented by Simon. HP 3326A Two-Channel Synthesizer: replaced, and replaced again! 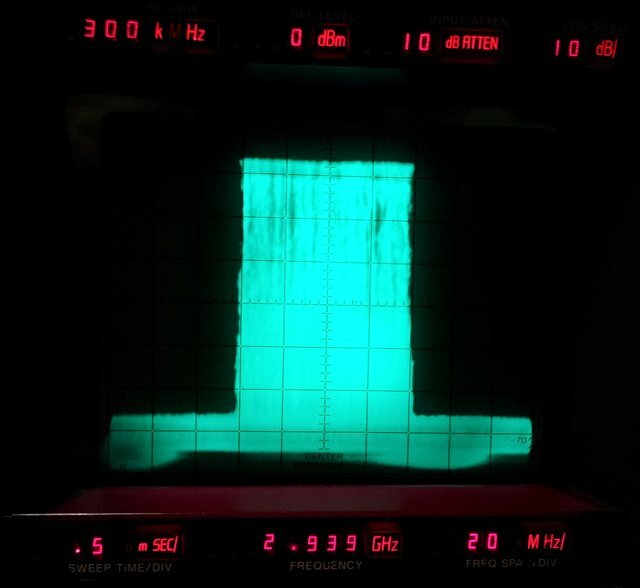 Agilent 4352B VCO/PLL Signal Analyzer: working! HP 6038A System Power Supply: all fixed! All content provided on "simonsdialogs.com" is for informational purposes only. The owner of this blog makes no representations as to the accuracy or completeness of any information on this site or found by following any link on this site. The owner of "simonsdialogs.com" will not be liable for any errors or omissions in this information nor for the availability of this information. The owner will not be liable for any losses, injuries, or damages from the display or use of this information. This is a personal weblog. The opinions expressed here represent my own and not those of my employer. In addition, my thoughts and opinions change from time to time. This weblog is intended to provide a semi-permanent point in time snapshot and manifestation of the various memes running around my brain, and as such any thoughts and opinions expressed within out-of-date posts may not be the same, nor even similar, to those I may hold today.